Cooking Curiously. : A Pig Slaughter. Some of our kitchen's cooks along with Chef Luce at the helm had the recent opportunity to see the circle of life exemplified in person. 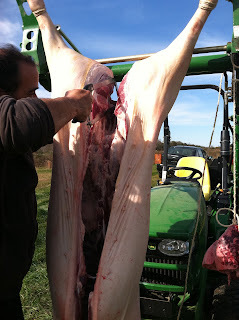 It was time to slaughter one of our farm's pigs. The time was right. It was beginning to get cold, so the meat wouldn't spoil as quickly. Also, Christoph and Isabelle Weisner happened to be in town from Austria. Two of the world's most well known and respected Mangalitsa farmers. They are both old friends of Chef, and we were lucky enough to have their help. The opportunity couldn't be passed up. The destined pig. Trotting happily along. None the wiser of his fate. A make-shift scalding bath. Made from a tub and a massive blow torch. Used to gently remove the skin from the pig. The water temperature had to be very precise. Not hot enough and the hair won't come off. Too hot, and you'll begin to cook the meat. A few of Christoph's tools. That cleaver alone weighed about ten pounds. He lifted it like a paring knife. One of Christoph and Isabell's tried and true philosophies is that the pig must be at ease when it is slaughtered. A scared pig does not a tasty pig make. High amounts of adrenaline will instantly taint the meat. Believe me, it makes a huge difference. Christoph greets the pig in it's own den gently and quietly as if to just say hello. The deed is quick. A captive bolt pistol is pressed between the eyes of the animal and fired. This is not a gun, and the bolt in question never actually enters the skull. Instead, it renders the animal immediately unconscious and free of feeling. There are 30 seconds between "shoot and stick" as Christoph tells me. Which means there is little time available after the animal is stunned before the bleeding must occur. If the animal's heart is not pumping, all the blood will not be drained from the body and will therefor rot the meat. A sterile bowl is laid just underneath the sticking point to catch all the blood. This will be used for blood sausage later! Christoph uses the pigs front leg as a pump to push any remaining blood from the body. At this point the blood is warm and it is important to keep it moving as it cools, otherwise it will coagulate. Isabelle volunteered to use her hand for this one! It is essential the the pig is hung at this point to allow the remaining blood to drain and to make the process of evisceration much easier. The pig after scalding and cleaning. Christoph beginning the first incisions. Very important to not cut the vital organs as the belly is opened. Thems be good eatin! The prize inside: caul fat and leaf lard. The caul fat protects all the vital organs and is often used to wrap leaner cuts when cooking. The leaf lard is two sheets of pure white fat that hang just within the pigs belly. These will be rendered and whipped - excellent on a slice of crusty bread! The lung and heart. These must be hung for a few days before cooking. They make a tasty stew! We also removed the liver, kidneys, stomach, pancreas, and brain from the pig - all in beautiful condition. All inner organs are rushed into a cooler. A hacksaw is used to separate the back of the animal. And there you have it! 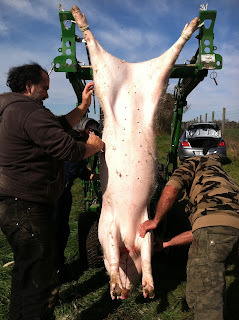 A pig: from trotting to halved in less than two hours. I'd say that's pretty efficient! What an incredibly rewarding experience. It makes me sad to know that many Americans will never have the opportunity to see first hand how this process happens. It gives you an immense respect for the animals and the farmers that raise them. More importantly, it gives one an appreciation for the animals life that was given, so that we may eat. Something that many meat-eaters simply can't understand. Stay tuned to see all the tasty treats that come of this beautiful beast!